I'll start by saying I was pleasantly surprised by this movie. Garofalo plays Abby Barnes, a witty veterinarian with a daily radio show titled "The Truth About Cats and Dogs." During the course of a broadcast, a listener, Brian, (played by Ben Chaplin) calls in because he's put a dog in roller skates for a photoshoot, and the dog is just not having it. Abby helps him out and charms him in the process, leading him to call the studio to ask her out on a date. Through a comic misunderstanding, Brian is led to believe that Abby's neighbor Noelle (Uma Thurman) is Abby, and Abby is a friend named Donna. The main romantic plot is pretty by the book: they both develop feelings for Brian (to different degrees), Brian is mystified and the lead man's best friend stock character (played by Jamie Foxx) dutifully reminds him that "he's thinking with his brain too much," Brian eventually discovers the truth, but ends up with Abby because it's a romantic comedy. This isn't a great movie, but it's above average, because Garofalo and Thurman are actually interesting characters. Despite the truly terrible trailer, which seems to suggest that Abby's problem is being too assertive or having high standards, the fact is she's incredibly insecure about her appearance, while Noelle, an exploited ingenue, is insecure about her intelligence. It's the relationship between these two women, and the way they develop, that makes this movie anything more than completely forgettable. (Nothing against Ben Chaplin, but he's the blandly perfect rom-com stereotype: handsome, artistic, sensitive, and British. I guess Hugh Grant was busy when they were casting for this film.) A lot of the jokes are actually funny, and there's a definite charm from the leads. That said, I can understand why Garofalo hates the movie, and why a lot of people like it. Roger Ebert, who gave it 3.5 out of 4 stars, wrote: "Of course all movies like this toy a little with the odds. The movie is based upon the presumption that Garofalo is not pretty, and of course she is." Ebert completely misses the point. The point isn't that Garofalo is or isn't pretty, it's that she feels ugly because she's surrounded by images of women like Thurman, because a cosmetics saleswoman berates her and reduces her to tears so she can make a sale. Garofalo points out that this was intended as a small budget indie-movie, but only later became big budget and commercialized, and this is evident. The aspects that make this movie above average are cut short to make room for more of the main romantic plot, and plenty of other 90s mainstream silliness. The film compromises. It stops shy of making the points it's aiming towards as an indie film, because mainstream rom-com viewers don't want politics, and you can only mention Simone de Beauvoir to show how intelligent someone is, but actually discussing her philosophy would be boring. It keeps some of its integrity, Abby and Noelle don't devolve into Jerry Springer-style "She stole my man!" cat-fighting, but are consistently there for each other. Their relationship is far more interesting than either of their relationships with Brian. As Garofalo also points out in an interview, the movie was originally going to end with Abby not getting the guy, which make sense, because her whole character arc is about establishing her own sense of self-worth and getting the guy is secondary to this development, but, in the final product, getting the guy is what creates her self-worth. It's an above average movie, but it could have been a great movie. 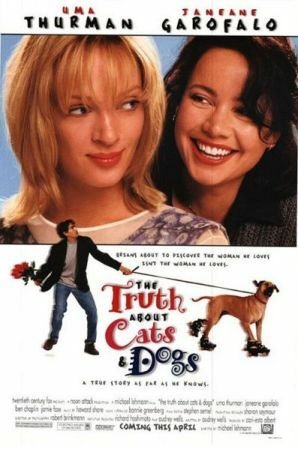 As for recommendations, if you want to watch a romantic comedy, The Truth about Cats & Dogs is a good choice. As to the putative reason for these reviews, David Cross, his role is extremely brief. He's a call in guest on the radio show, a man whose dog, Lucille, has a cold. (Coincidentally, in Destiny Turns on the Radio, Cross played an agent representing a singer named Lucille.) He also has a brief background cameo with Bob Odenkirk as Bookstore Man. They're on screen for about ten seconds, nine of which are spent directly behind Thurman and Garofalo. It's been a long time, but I remember thinking this movie would have been better if Brian had been "in on" the deception, and was playing with the two women as much as they were playing with him. . . I feel like this movie had a lot of potential if only it were kept simple and focus on the romantic aspect was kept to a minimum. Just 10 years ago only 25 percent chose this option to receive the ashes back after cremation.